290 pages | 38 B/W Illus. Scottish traditional music has been through a successful revival in the mid-twentieth century and has now entered a professionalised and public space. Devolution in the UK and the surge of political debate surrounding the independence referendum in Scotland in 2014 led to a greater scrutiny of regional and national identities within the UK, set within the wider context of cultural globalisation. This volume brings together a range of authors that sets out to explore the increasingly plural and complex notions of Scotland, as performed in and through traditional music. Traditional music has played an increasingly prominent role in the public life of Scotland, mirrored in other Anglo-American traditions. This collection principally explores this movement from historically text-bound musical authenticity towards more transient sonic identities that are blurring established musical genres and the meaning of what constitutes ‘traditional’ music today. 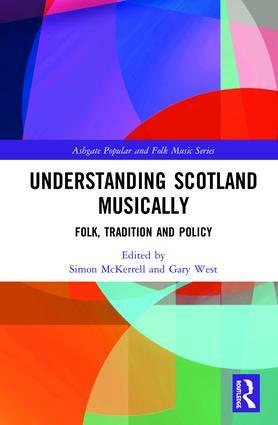 The volume therefore provides a cohesive set of perspectives on how traditional music performs Scottishness at this crucial moment in the public life of an increasingly (dis)United Kingdom. Simon McKerrell has interdisciplinary research interests focused upon the social impact of music and how this relates to policy. He is the author of Focus: Scottish Traditional Music (2015), and the co-editor of Music as Multimodal Discourse: Media, Power and Protest (2017). He is currently Associate Dean for Research & Innovation in the Faculty of Humanities and Social Sciences at Newcastle University. He has previously held positions at the Universities of Sheffield, Glasgow and the Royal Conservatoire of Scotland, and at the National Piping Centre in Glasgow. Gary West holds a personal chair in Scottish Ethnology at the University of Edinburgh, where he also serves as Director of the European Ethnological Research Centre. His key teaching and research interests examine the ways in which we relate to the past from within the present, and he has published widely in the fields of folklore, tradition, heritage and traditional music. He is chair of Traditional Arts and Culture Scotland, a past board member of Creative Scotland, and he presents Pipeline, a weekly specialist music programme on BBC Radio Scotland. He is also an active musician, having toured widely in the UK, Europe and North America, and has performed on around 30 CDs.